Immediate: As an additional cost to play this card, discard 2 cards. Give a character involved in a faceoff +2 power until the end of the faceoff. Most dragons didn't make it past the toughest parts of the Gauntlet of Fire. 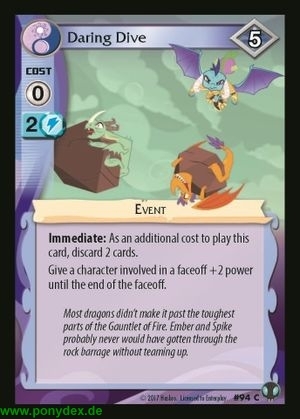 Ember and Spike probably never would have gotten through the rock barrage without teaming up.